So somehow I did it—wore at least one me-made every day of May 2014, and got some kind of documentary photo to prove it, even if was just a low-quality bathroom mirror Instagram selfie. Not only that, but it was really a "Me-Making May" (to use Susan's term). I completed EIGHT garments for myself during the month, and FOUR for children (which is a definite record for me—I didn't even have time to blog them all! ): two dresses, five tops, three skirts, a sweater and a jacket. Um, that's my average sewing output for an entire year. I have too few clothes. That is, too few clothes in certain basic categories that I rely on a lot: basic denim and solid-colored skirts, solid-color tops, jeans, knit camisoles. 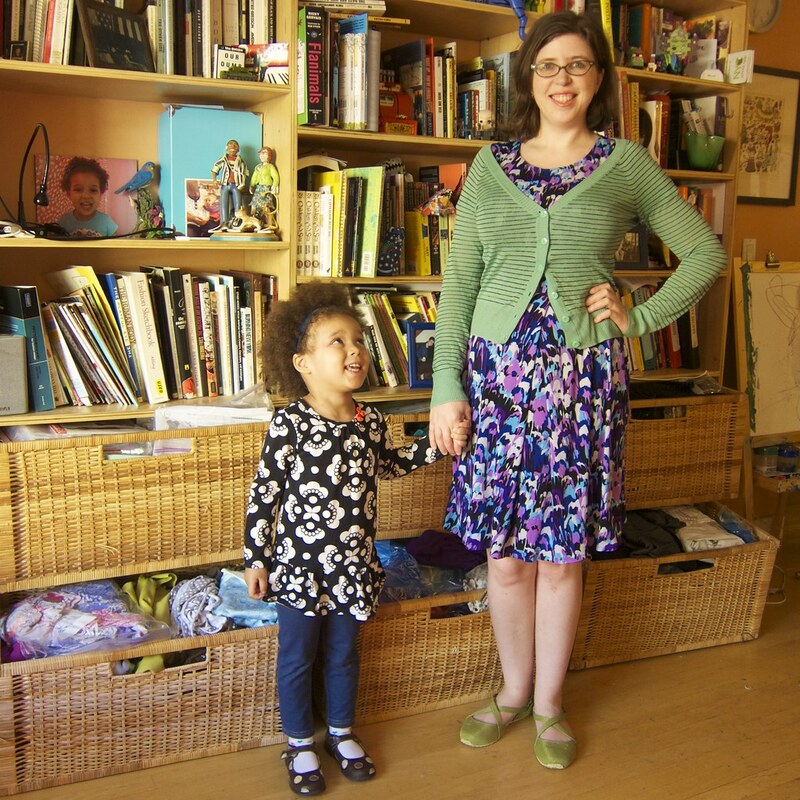 This is partly because I stopped buying most fast fashion two years ago after reading Overdressed: The Shockingly High Cost of Cheap Fashion... and I haven't really been focused enough in my sewing or thrift shopping to fill those basic areas. I dress very differently when I'm going to be showing photos of myself on the internet. I wear heels and makeup slightly more often, and more dresses and skirts than usual. I swear I wore jeans for more than 50% of days in April, but since I don't have any me-made trousers I actually like, I only wore jeans or trousers four times the entire month of May. I have/make too many polka-dot things. I know, this blog is called Polka Dot Overload. But I also love all kinds of other prints—bold florals and geometrics, stripes, chevrons. I need more of a mix here, I'm starting to bore myself. How about you? What do you have too much or too little of? Anyway, here is the last week of Me-Made-May... on to June! 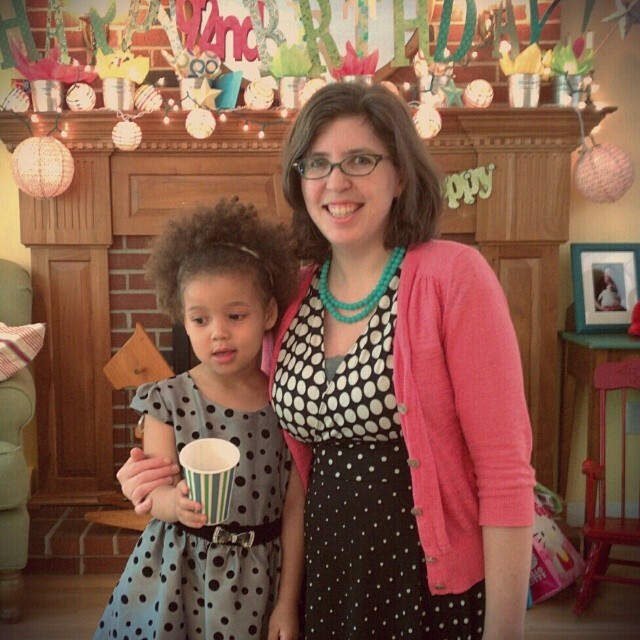 The little girl and I wore polka dots (yeah, I know) for my grandmother's 92nd birthday party. Mine is the third wear of my McCall's 6070 for the month. I think I need to make more of this pattern, as I'm obviously very into it. 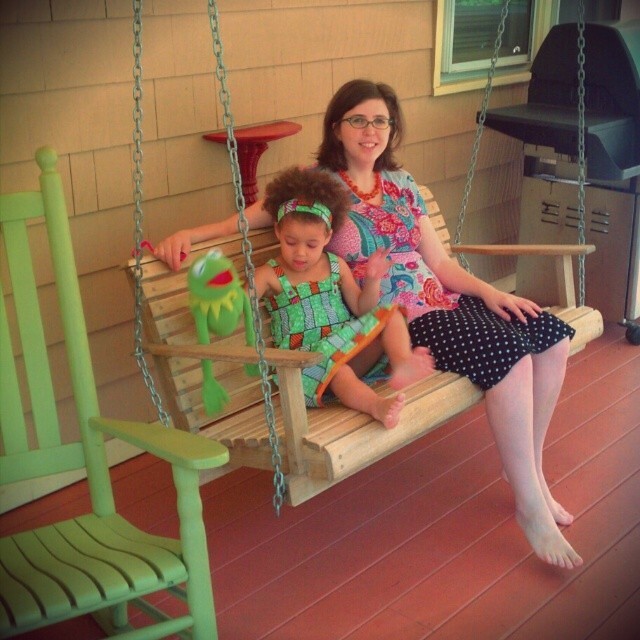 I'm relaxing on my mom's porch in one of my Cake Hummingbird tops and a self-drafted knit half circle skirt. Z is wearing her new wax print Made By Rae Baby Sunsuit as top and Oliver + S Lazy Days skirt. Yes I have pale legs. My Tilly and the Buttons Miette skirt (blogged here) and Burdastyle Magazine Feb. 2010 top (never blogged). Plus old RTW cardigan for the summer-like heat. 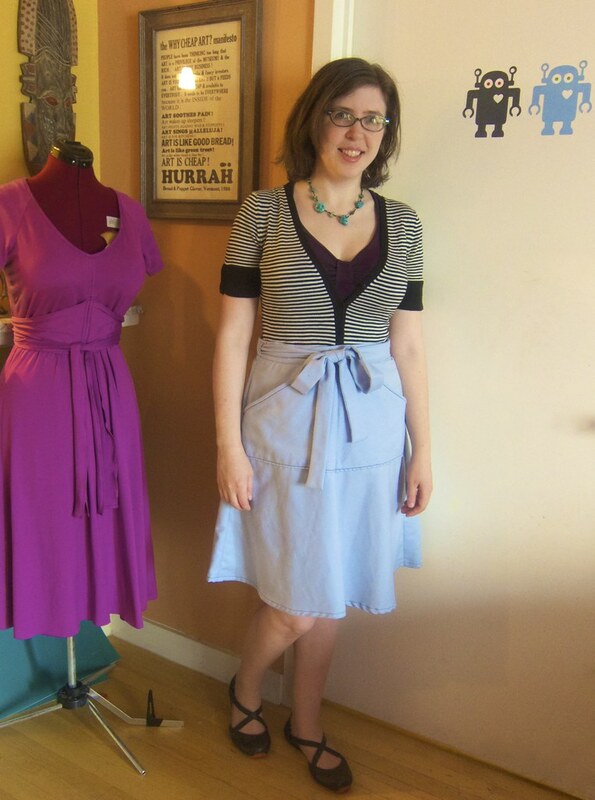 Me Made May 28: Finally hemmed! Finally got my act together nd started hemming the five unhemmed me-made dresses and skirts that had been piling up (I was wearing them, but unhemmed). The dress is vintage Simplicity 7575 (blogged here before hemming) and the jacket is out-of-print McCall's 5529, just finished last week (blogged here). Jalie 2005 T-shirt and Cake Hummingbird denim skirt. My six main drawers of fabric, patterns and yarn are behind me (though I will admit I have fabric squirreled away in a few other places in the apartment). Wearing my (finally hemmed) Cake Patterns Red Velvet knit dress. I think this is my favorite photo for the whole month. The me-mades here are the simple knit half-circle skirt and some hidden underthings. PHEW. So what are your wardrobe challenges? So how did you find the hemming, in the end? Do you have a system that works for you now? Naw, I just forced myself to do it in the slapdash way I have been. Still working on the hemming fear! Hey, it looks good. And the more you do it, the more systems you'll invent as you go. You have to start somewhere! Yes! I have too many clothes AND too few clothes as well! Too many clothes that don't fit because I've gained weight (but I still have this idea I will lose the weight and fit back into them, kill me now). Too few clothes that are comfortable and look good on me and flatter me. Too many polka dots? Now THAT is just silly. Perhaps you need to supplement dots with other prints and solids, that I can understand, but it is not possible to have too many polka dots, especially for YOU. Oh, I do the same thing with the too small clothes, too. I finally am forcing myself to acknowledge that if I haven't been able to wear it since before I was pregnant with my daughter in 2009... it's NOT going to happen. One of the hard things as a chronic self-seamstress is to learn to toss handmade items with as much abandon as if they were rtw. But you know, there's an easy fix for that: make most of your clothes :-). Eventually you just see them as clothes, which makes the letting-go process easier. And another one, which has been more of a challenge for me as well, is to learn to make more basics. Thinking of sewing only as a hobby, where everything you do is supposed to be entertaining, only leads to an unwearable wardrobe. 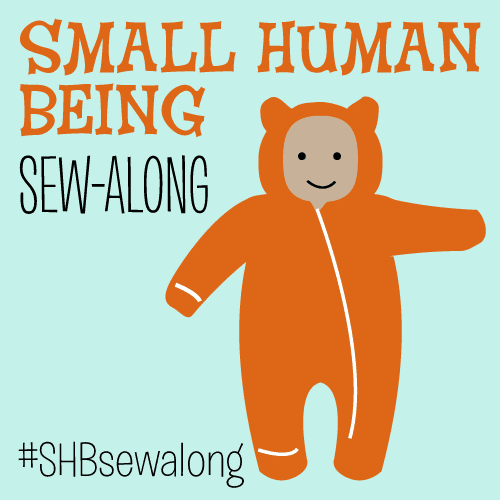 In fact we all wear boring basics a lot, and that means in theory we should be sewing a lot of them too. On the other hand, if you can overcome that frame of mind, you can toss out a season's worth of say t-shirts in a single focused afternoon :-). 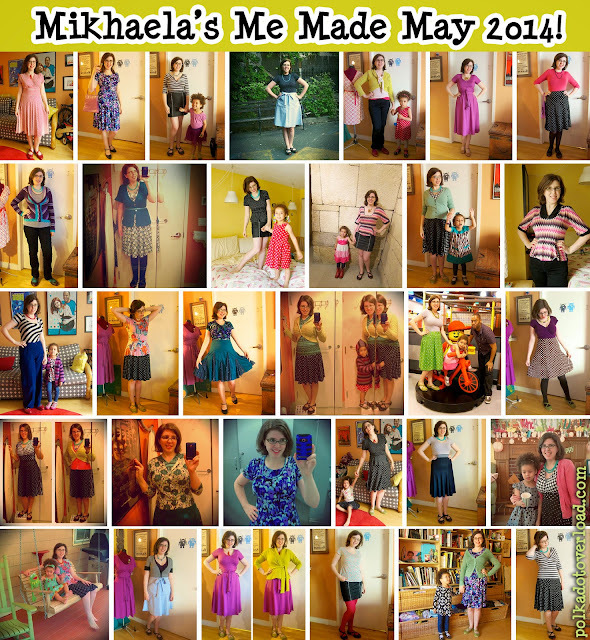 I managed to wear a me-made item (with MANY duplicates, and very few full outfits) the entire month, but didn't really document any of them because I didn't think I would actually be able to do it! I also donated four lawn-sized (yes, LAWN) trash bags of clothes that I don't/won't/can't wear, which leaves me now with the dilemma of too few clothes. And most of what I do have is RTW and will soon be in need of replacement. My summer sewing is about making basics (including PANTS) so that the next time Me-Made-May rolls around, I can fully participate and really challenge myself! You did awesome! Totally in the same boat with too many and not enough clothes. Me-Made-May made me reassess and purge even more, though I already did a lot of that before moving. 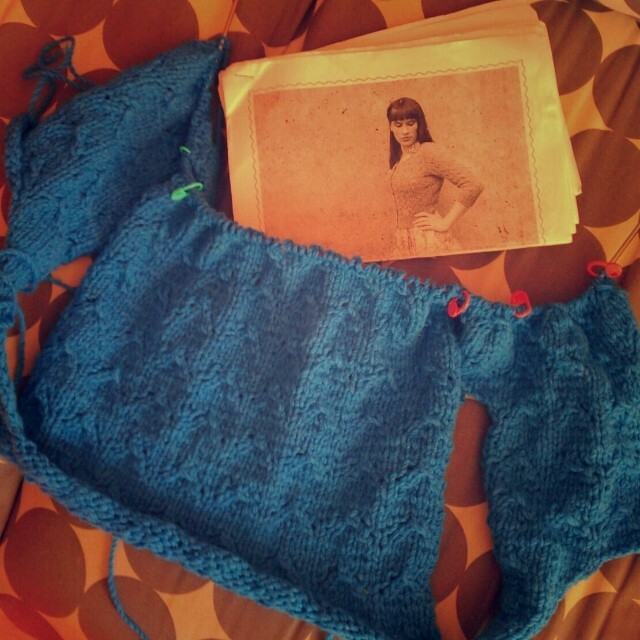 New goals that came out of the challenge for me: 1. make more basics, and 2. knit more! since in this climate a sweater is almost always handy. I too have far too many clothes and nothing to wear, I will put away lots of clothes to see how much I miss them. Regarding making ourselves more pretty when we're "on display" I found that in clothes I like I stand prouder and like myself more, so I'm going to go for clothes I like and make me feel good, even if someone thinks I'm over the top, I don't care. I want to wear well-made, well-fitting clothes that are fun and colourful so I'm going to do just that. Great post! I am in the same boat. During MMM, as I wore an item I tossed it. I culled about a third of my closet. Now I have a big gaping hole. But since I refused to do crisis sewing during MMM, June may prove to be a challenging month. Now I'm going through my fabric collection. I can no longer consider it a stash. I need to purge it as well. I didn't do MMM because I wear what I've sewn or knitted very often and just can't cope with a daily photo, but also because there are days that I need to wear a suit, and that is just not something I've sewn. I do understand the too much/not enough feeling. 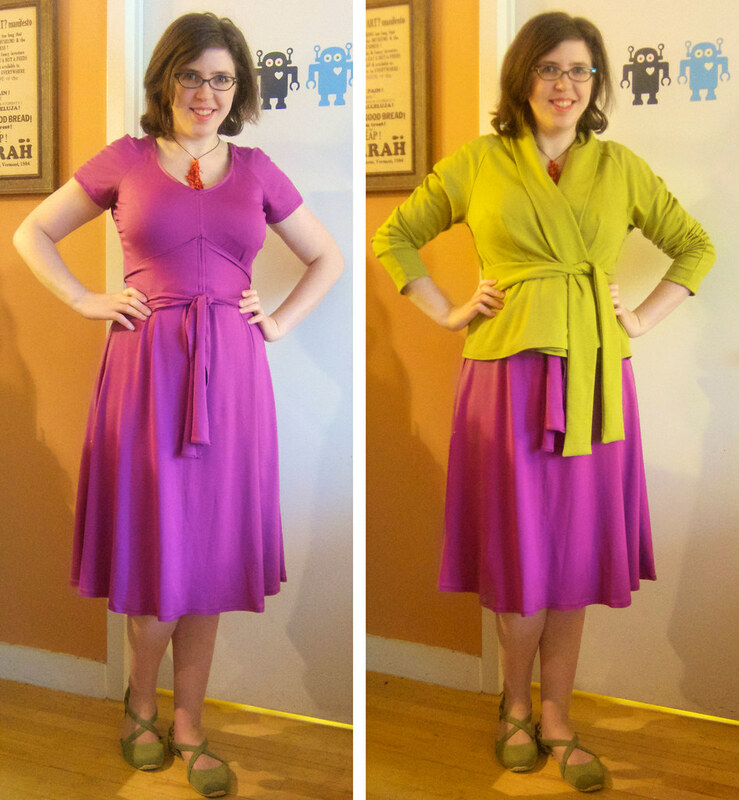 I sew a lot of separates, which are a bit more versatile than a dress, so I don't have such a large problem with this. Honestly, conquering my fear of trousers was a big help and sewing jackets also helps. It's fun to throw on something I've made before dashing out the door.